The Mbabane Hilton Garden Inn is an 8-storey hotel building situated in the heart of developing Mbabane. The primary spaces of the hotel are designed to create vertical separation and privacy between public and private (guest) amenities. The iconic tower portion of the building, with its swooping and undulating feature façade, is architecturally differentiated from the base of the building, and is solely dedicated to hotel guestrooms and hotel facilities. Public areas, including a reception, restaurant, bar, lounge and conferencing facilities are accommodated on the Ground Floor of the building. The conferencing facility hosts four meeting rooms of varying sizes, with two of the larger rooms separated by sliding-folding doors giving them the flexibility to become a single large conference room. Reception and the main hotel entrance are located adjacent to the on-grade, on-site guest parking where guests are greeted with a generous porte-cochere entry. The main guest parking is located at to the rear of the site, while additional parking is provided in an existing parkade close by. The entrance to the building is reinforced by a full-height internal atrium which forms the central and primary focus space of the building, overlooked by all the guest room corridors. The central atrium houses the restaurant, bar, lounge and conference break-out facilities. These spaces also link to the ground floor landscaping and deck spaces via two large sliding folding doors. The hotel consists of 124 guestrooms which are all accessed via full-height glass scenic lifts leading from the ground floor lobby. Guest amenities are housed at the first floor and include a guest laundry and fitness centre, which looks out onto the landscaped pool deck – a dedicated guest amenity with a lap pool, low-level children’s swim area and garden. Situated up against a hill to the south of the city centre the building and landscape deck will provide unobstructed views across the valley towards the city. 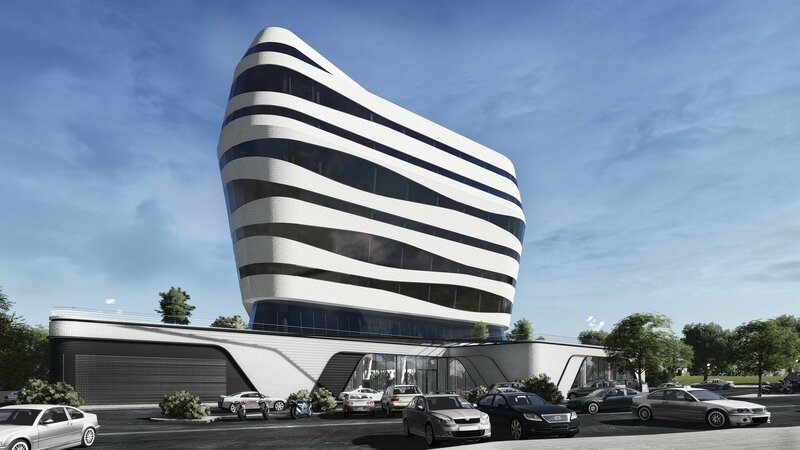 This location, and the unique design of the building, gives this hotel a presence and prominence unique to the Mbabane city context.